Sure, every guy’s got his favorite local beer, but haven’t you ever dreamed of more? 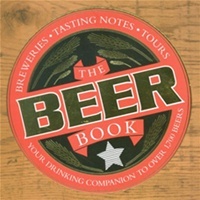 The Beer Book points out beers worth travelling for, info on breweries worldwide and offers tips on brewing techniques as well as any other beer related knowledge you may be thirsting for. The ideal drinking companion - an extensive directory of over 2,000 beers. Beer, the drink to taste, savour, talk about and travel for. Explore its astonishing variety and rapidly expanding new tastes - thirst-quenching lagers, 'meal-in-a-glass' stouts, peppery white beers, tangy fruit-based brews, and classic ales and bitters - with this up-to-date guide to every good beer in the world. Visit over 800 breweries and read detailed tasting notes for over 2,000 beers from a team of local specialists. Whet your appetite with tours to key beer-producing destinations. And discover the beers to try and how best to enjoy them, with brews that are anything but 'a pint of the usual'.